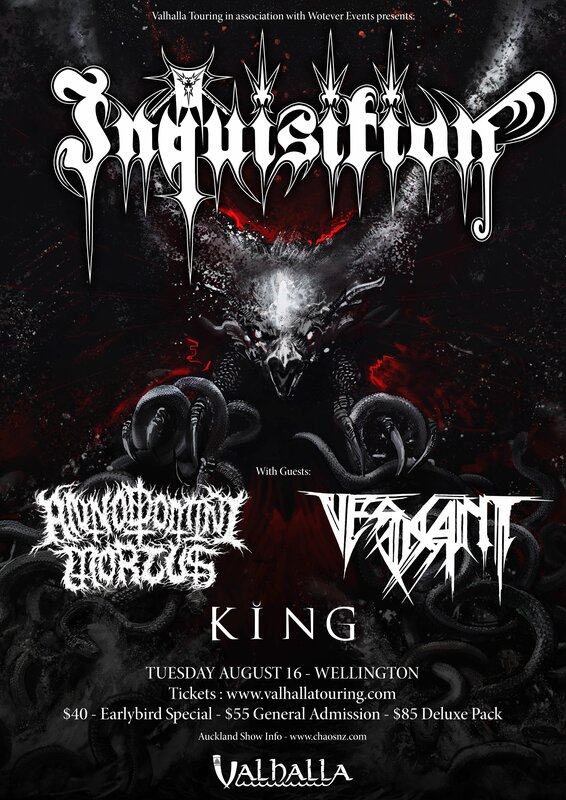 Legendary Black Metal horde INQUISITION will return to New Zealand for a long awaited headlining tour this August, to spread their blackened, cosmic chaos across the nation. Inquisition formed nearly three decades ago and morphed from a thrash band into one of the most hellish raw black metal bands this planet has ever produced. Featuring Dagon on vocals and guitar and Incubus on drums, the cacophony of noise generated by the bands two members has roots in two musical camps. Early era thrash and primal black metal collide to produce one of the most recognised ‘signature sounds of any band in their genre. Dark and ominous passages explode into chaos filled whirlwinds of blast beats and buzz saw riffing, enveloping the listener in a suffocating reminder of what the true spirit of black metal really is. Inquisition draw their power from the darkest roots of human existence. The forces of cosmology, paganism, ancient cultures and Satanism have combined to build their maleficent basilica of sound. Bloodshed Across The Empyrean Altar Beyond The Celestial Zenith is the epic title of Inquisition’s forthcoming brand new album due for release on August 26 via Season Of Mist, so New Zealand fans will be among the first in the world to experience songs from the new opus live! – King – An unfaltering and melancholic blackened metal force, featuring members of Psycroptic and Blood Duster, King hail from Melbourne and have recently signed to Indie Recordings. – Anno Domini Mortus – Burning the Black Flame of tradition primal black metal. Journey through an atmosphere of venomous darkness, and realms of torment and agony. – VESICANT – Chaotic black/death void worship. Expect their upcoming album to herald a nihilistic age of humanities downfall.